Today, I am loaning my blog to published author Daniel F. Bowman. We both attended Cornerstone University but recently connected through a mutual friend. If you are interested in a good read, especially historical fiction, I would encourage you to check out his book – Alaric, Child of the Goths. My wife Amanda and I rarely get a chance to take a weekend off and spend it together (without the kids), but back in 2009 we visited the Toledo Zoo (with our son). Amanda was wiped out from walking all around, so I had the chance to watch the History Channel after she fell asleep. We have never had cable, so this was as much a part of vacation as was watching the polar bear tear apart a trash can. The episode was—you guessed it—about the Goths. I stared at the screen as I heard how a group of farmer-soldiers were cheated by Rome but decided to stand up to her, though she was the greatest empire in the world. They would not put up with bullying. The program ended: “Oppression sires rebellion, and when pushed too far, even the weak and the shattered can rise to challenge their oppressor.” I feel chills every time I hear that. How did you hear about the writing contest? I looked for “historical fiction 2012 writing contests” online. I was discouraged by the trouble of getting an agent, and knew that trying to approach a publisher directly for historical fiction was a waste of time. After looking through my list of contests, the best bet seemed to be Creative Print Publishing (CPP), as that had no fee to enter and the winner received publication. I haven’t always written, though when I think back, I realize that I have tried for a long time. When I was a child, I wrote 1½-page stories of alien abductions, ending before the main character ever made it to the spacecraft! I also like pirate novels, though these always stopped after the third mutiny. During college, I began writing “The Tinker’s Sons” about two boys (based on my brothers) who were destined to overthrow the evil empire. It was fun telling them the story each night. Do you have other plans in place along the same storyline? I began my 3rd book this month. Amanda—my wife and editor—wants a book with a female POV. I’m up for the challenge. It might help me as a husband to get in a woman’s mind. What are you plans for writing, hobby, full time, dreams? So far, it’s a nice hobby and publishing was a good goal before turning 30. I barely made it! Ideally, I would like to get paid for writing so that my main job (teaching ESL) became additional income, rather than the way it currently is. Then again, I don’t know how I would handle the freedom of my own hours. I have a feeling that I would never feel caught up enough to stop working. History is full of stories—true ones (unlike the wildly-adapted-but-still-enjoyable Braveheart, 300, Gladiator…). 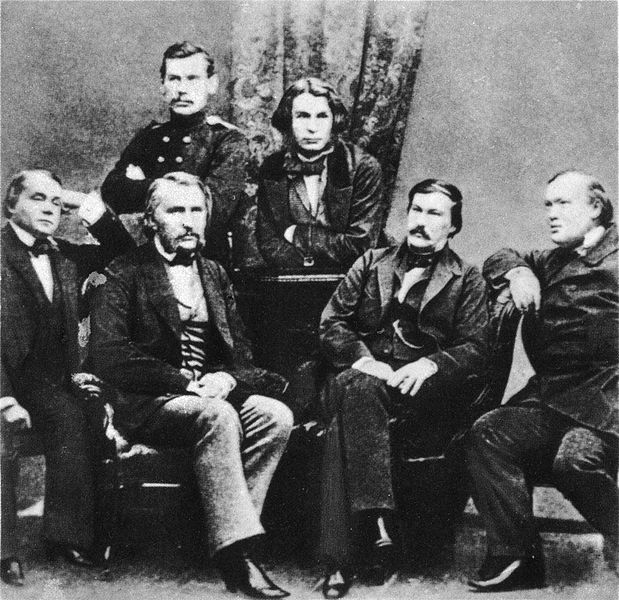 So many heroes, villains, and tragedies have happened which far exceed the fictional ideas of authors, and many of these stories are known only in boring monographs. I aim to remedy that. Do you write each day? If so, where? When? I recently finished a break from writing. After submitting Hammer of God, I wanted to take off the rest of 2012 and prevent burnout. When I am writing, I try to write 1,000 words daily = 5,000 weekly. This is doable and I usually achieve it. Plus, ideally, I could finish a book in six months this way. My office (more like a storage room most of the time). Having a door between me and my family is a psychological help for focusing. I also work well as I proctor quizzes at work, wear headphones in the school computer lab so no one interrupts, or am in busy places apart from home. I think it’s because I can ignore everyone there. The non-office places are perfect for putting down ideas, but I tend to need a large chunk of time to put them all together. This is the harder question. I used to write in the morning, but as my son has proven to be a morning person, I no longer have that time to myself. So I guess this coming year will have me in the office at night. The best tip I came across for “when” is to always plan my next session before I end my current one. That way I can write anywhere/anytime, knowing what I’m supposed to do next. I rarely have writer’s block because of this. Today, I am offer my blog to writer Jessie Clemence who I met through my writing comrade Josh Mosey. If you are a parent, mother, Christian, or just in need of a laugh, I suggest you visit her blog and pick up her book when it hits the shelf. My editor suggested it because she saw that theme running through some of my other writing. Also, I have lived this book ever since my first child was born almost ten years ago. Since my family and friends are all in the book, I think we’d just all play ourselves. We’d have to be a reality TV show, like the Duggars on 78 Kids and Counting. Motherhood is hard and requires special character traits that God can help us develop. Green Plastic Monkey is being published by Discovery House Publishers in Grand Rapids. I always have trouble with this one, because it really is a parenting book and a Bible study together, and it’s fun. I haven’t found another that fits these criteria. But I know that Rachel Jankovic has written Loving the Little Years, Motherhood in the Trenches. That theme of enjoying a difficult time with God’s help is certainly running through Green Plastic Monkey, too. My editor suggested it! It took me a while to get the nerve up to try it, because parenting has been a difficult road for me. But in the end, I think that’s the book’s strength. I don’t have it all together. I don’t know what I’m doing. My kids are thriving because God has changed my heart and shown me His grace. I think that will resonate with other mothers who are struggling. My primary spiritual gift is ridiculousness, and the book is full of it. It’s fun and silly and real. Many mothers will read the book and walk away thinking, “Thank goodness I’m a better mother than Jessie.” And I’m totally okay with that, as long as God’s word gets into them while they are laughing at me! Thank you for participating Jessie! This is a hard question. I’d like to say it came from everywhere. What I was reading at the time – How the Irish Saved Civilization, what I was interested in writing – grand sweeping epics, coming of age stories and, yes, romance, and something that happened in my life – a vicious storm that swept through my home town. The sort of storm that makes noon like night. It causes the constant hum of reality skip a beat and become suddenly vicious and beyond your control. All three of these things collided one summer. Fantasy – high adventure, coming of age, young adult. I write with some characters in mind. I picture my villain Maero as Russell Crowe from Gladiator. Strong, noble, and a family man, but he is bent and tortured by his loss. Beyond that, the characters are drawn from people I have met, with the possibility of the main character’s best friend Comitis – recently, I’ve tried to paint him in the light of James Roday (Shawn Spencer) from Psyche. Calelleth’s leaders have sworn to forget the horrors of their past and succeed in rewriting history for their people, that is, until an army arrives unannounced demanding the past atrocities be remembered and atoned for. I’ve met with an agent and will be submitting my novel to an acquisitions editor soon (hopefully next week). I’d like to have it represented. I know this is a difficult task but I believe in my work and will be relentless about publication until it happens. About a year. However there have been numerous drafts. Some chapters have been rewritten 8-9 times, others 4-5 times. I’ve been working in the debut novel, outlines for subsequent books and the history behind my world for over 8 years. If you’ve read The Emerald Atlas you’ll find children thrust into roles that they find unfitting. One day at an orphanage, the next caught up in the grand struggle of trying to save a world. Also, the academics and young love of Harry Potter, the Merlinesque grandfather in innumerable tales, and the robbing of the rich to equip the poor that is accustom to Robin Hood. Sadly, I never read the Lord of the Rings while growing up. While that might shock some people I think this was to my benefit as it is not old hat now. I did not begin to write or read a lot until I was in college. I read while younger but stopped for sports. I rediscovered the spark by watching the first Lord of the Rings film. The age and reality of the other world was enchanting. I couldn’t stop until my one tale was written and I have been reading and reading since. I love the Inklings (C.S Lewis, J.R.R. Tolkien and others) and my writer’s group is called the Weaklings in tribute to them. This is the first installment of seven books. You follow not only the life and death of many characters but also the redemption of a people that suddenly come to realize the depth at which they have scared the earth and the peoples they have forgotten beyond their borders. In The Tale of Calelleth I have tried my best to intertwine the familiar portions of Young Adult fiction – love, coming of age, and the reality that comes with responsibilities of adulthood with a medieval epic. There is a reason Jot is free. Most writers aren’t rolling in piles of cash. We understand that. In fact, we represent that. Re-blog our posts. If you don’t have a blog of your own, start one and use it to re-blog our posts. E-blast your contact list info about Jot. If they tell you that the email wound up in their spam folder, maybe you should just remove them from your contact list. Those aren’t the type of people for you. Here’s this week’s post from Julia’s place. The words “the notes from the piano,” need to be included in a 100 word story. Enjoy. “Look at this, Jones,” said Captain Micks. “I know. You’d think when this whole place came down it would have been crushed.” Jones stepped forward and struck a chord, the notes from the piano were crisp and clean. 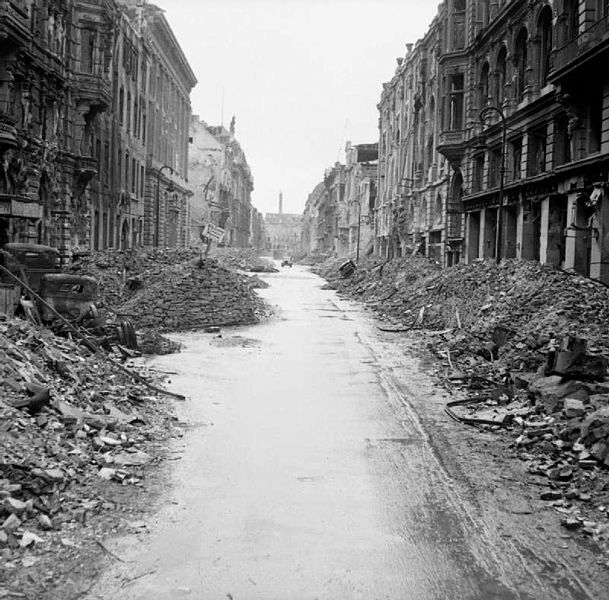 The sound resonated off of the skeletal structures and permeated the vacant rubble strewn avenue. “Don’t do that again,” Warned the Captain. This was until I received a gift from my parents for Christmas, (kudos to my wife for the assist). 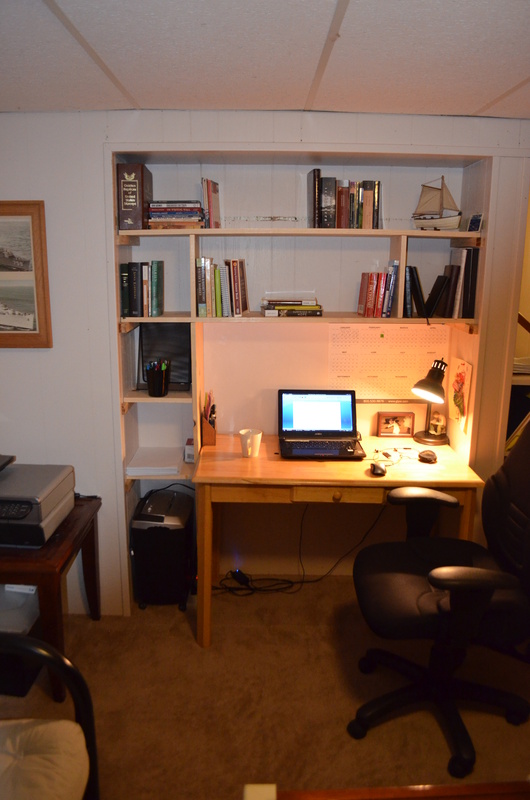 It was money toward transforming my bleak writing hole into a useful and inspiring writing space. This space is essential. It has to be a retreat, though located about 100 feet from my bed and the chaos of a living room dominated by my lovely children. 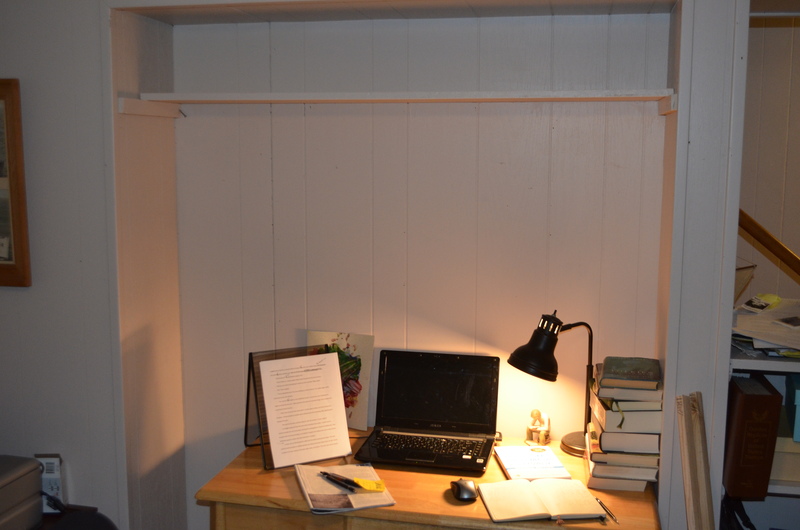 Thus, I have the following pictures of my new writing space (I apologize in advance for the poor lighting). 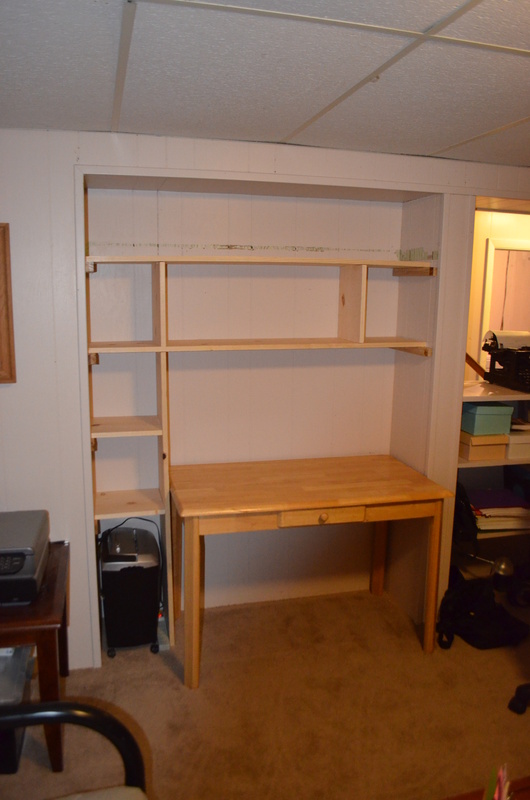 Photo 1 – All that can be seen in the built-in is the desk and one flimsy shelf that I dared not set any of my precious books upon. Photo 2 – Main shelves in place. 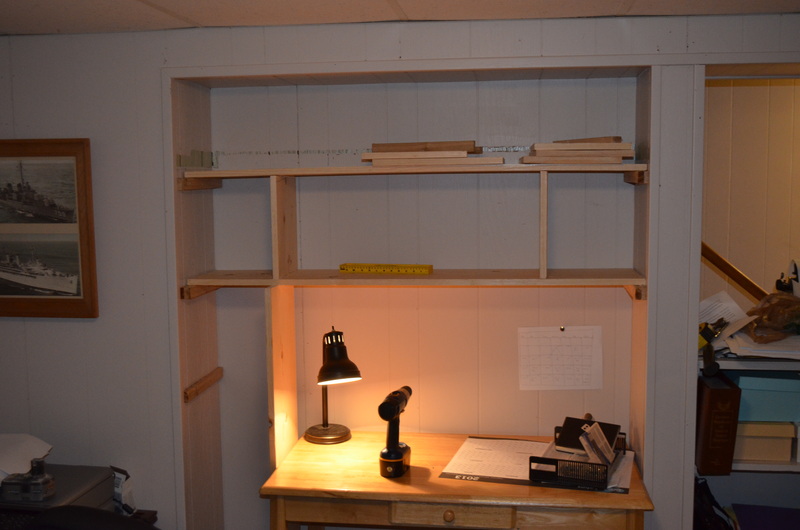 Photo 3 – Side shelf in place. Photo 4 – Finished for now (paint to come later). Now my inner writer has a place to call home. Time to get to work. Confession. Unlike last year, my yearly reading list is, admittedly, somewhat embarrassing. I hate not to report what I have read because there were several great books in there (which I have made bold in my list) but not as many as I would have liked. I Hope this year contains more books, and more submissions. Cheers, and a happy belated New Year to you all.